If you travel a lot for work, or you take a long vacation with the family each summer, then part of you might worry about your home while you’re away. Perhaps you’ve installed cameras and other smart home features so that you can check on things while you’re gone, but the one thing you can’t see is if a pipe is leaking behind a wall or under the floor. You can see when there’s a flood on the floor, but wouldn’t you rather avoid that when you’re hundreds of miles from home? At Gladiator Repipe in San Jose, we can provide copper repiping for your home so that you can rest easy when you’re away for work or on vacation. We can complete your repipe in as little as one day, and you won’t have to worry about floods and water damage! When you come back from vacation, all you want to do is put down your suitcase, sit down in a chair, and unwind for a bit. What you don’t want to do is walk into the bathroom or kitchen and find water running out from underneath the cabinets. 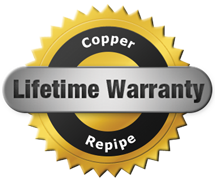 With new copper plumbing, troublesome pipes that could have leaked while you’re away will stay tight and sealed. If you’re worried about coming home to a flood, then give us a call before you leave. You might be the type of person who does a “once-over” of the house before you leave for an extended period of time. You make sure all the windows are closed and locked, and you test each door to ensure it’s closed and secure. When it comes to your plumbing, it’s a good idea to check your faucets and drains before you leave. Make sure that no faucet is dripping and check that no drain is clogged or emptying slowly when the water is running. As for your water heater, it may have a “vacation mode” that you can turn on while you’re gone. You’ll also want to look under the cabinets and near your main water valve to ensure there are no leaks. If there are, then we can be there right away to take care of any issues. 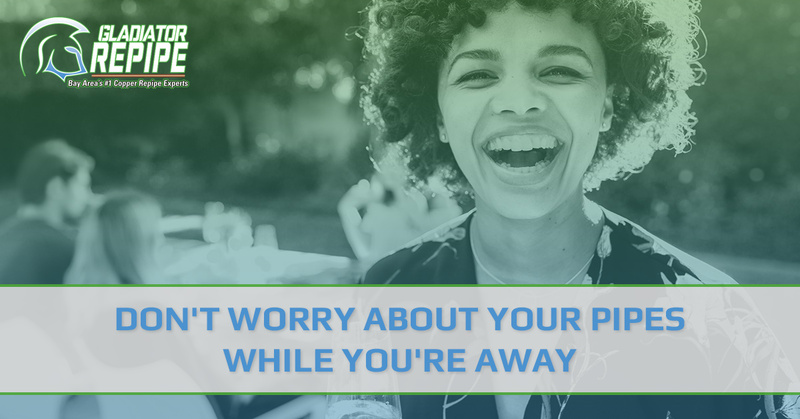 Instead of worrying about leaky pipes, you can look forward to your vacation! If your annual family vacation is coming up soon, or you’re leaving town for a weeks-long business trip, then don’t let your plumbing be the only thing on your mind. Contact Gladiator in San Jose today to schedule your repipe and let us take care of everything. We work quickly and diligently, and you can enjoy your time away without so much as a thought about your pipes. We serve the entire South Bay area, so no matter where you’re located, we can help you. Contact us by using the form below or by giving us a call at (408) 649-7290.